Are you looking for a relaxing escape in the countryside of Merrijig? We offer off mountain holiday house/cottage accommodation in the high country of North East Victoria, with magnificent views of Mount Buller, Mount Stirling and Timbertop beyond the Merrijig Delatite River Valley. We are situated 15 kilometres from the Mansfield township and its retail offerings. Whilst a 15-minute drive to Mount Buller. 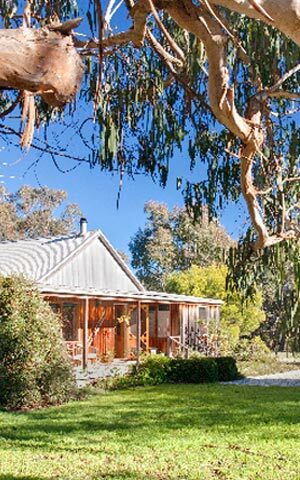 We are situated on 22 acres of rural rolling countryside, upon a ridge underneath towering bluegums. The cottages are fully self-contained bed and breakfast (basket at extra cost) accommodation. See the best of what our region has to offer and what's on during your stay at Bluegum Ridge Cottages! Wow! We love this place. We loved riding Mt. Buller and loved returning to this amazing property. Des and Mary are just so nice and so helpful. We will return. Let’s hope we return for nationals again. A restful fortnight in a wonderful location, and made especially so by very thoughtful and caring hosts, Mary and Des. Many extra little touches and items together with a warm welcome made a great difference! Thanks so much.